Allied Recycling is committed to respecting and protecting your privacy. We wish to be transparent on how we process your data and show you that we are accountable with the GDPR in relation to not only processing your data but ensuring you understand your rights as a client. It is the intention of this privacy statement to explain to you the information practices of Allied Recycling in relation to the information we collect about you. We gather statistical and other analytical information collected on an aggregate basis of all visitors to our site. This non-personal data comprises information that cannot be used to identify or contact you, such as demographic information regarding, for example, user IP addresses where they have been clipped or anonymised, browser types and other anonymous statistical data involving the use of our site. In order for us to provide you with any of our services, Allied Recycling need to collect personal data for delivery and ongoing service, this may be at your private residence. We may use the non-personal data gathered from visitors to our site in an aggregate form to get a better understanding of where our visitors come from and to help us better design and organise our site. 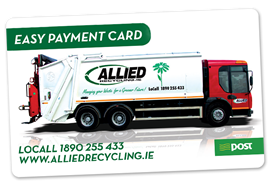 In any event, Allied Recycling are committed to ensuring that the information we collect and use is appropriate for this purpose, and does not constitute an invasion of your privacy. How will Allied Recycling use the personal data it collects about me? Allied Recycling will process (collect, store and use) the information you provide in a manner compatible with the EU’s General Data Protection Regulation (GDPR). We will endeavour to keep your information accurate and up to date, and not keep it for longer than is necessary. We may pass your personal data on to third-party service providers contracted to Allied Recycling in the course of dealing with you. Any third parties that we may share your data with are obliged to keep your details securely, and to use them only to fulfil the service they provide on our behalf. When they no longer need your data to fulfil this service, they will dispose of the details in line with Allied Recycling procedures. We reserve the right to transfer information (including your personal data) to a third party in the event of a sale, merger, liquidation, receivership or transfer of all or substantially all of the assets of our company provided that the third party agrees to adhere to the terms of the Website Privacy Statement and provided that the third party only uses your personal data for the purposes that you provided it to us. You will be notified in the event of any such transfer. Allied Recycling facilitate you, our clients, rights in line with our data protection policy and the subject access request procedure. This is available on request. Right to judicial review: in the event that Allied Recycling refuses your request under rights of access, we will provide you with a reason as to why. Data will not be held for longer than is necessary for the purpose(s) for which they were obtained. Allied Recycling will process personal data in accordance with our retention schedule. This retention schedule has been governed by our internal governance. If we are collecting your data for a contract (e.g. wheeled bin collection service) and you cannot provide this data the consequences of this could mean the contract cannot be completed or details are incorrect.